Researchers at Lawrence Livermore National Laboratory have discovered lithium ion batteries can last longer and charge faster if their electrodes are treated with hydrogen. The breakthrough could lead to significant improvements in the performance of the batteries, which are commonly used in smartphones, digital cameras, electric cars and home energy storage systems. Batteries have positive and negative electrodes and electrons flow between them when the battery is providing electricity or being charged. In lithium ion batteries, the binding between lithium ions and the electrode material helps determine the performance of the battery. The Lawrence Livermore National Laboratory (LLNL) research focused on graphene electrodes and the scientists discovered that by treating them with hydrogen, defects in the graphene could be used to their advantage. Interaction of the two opened small gaps in the coating that mean better binding between the electrode and lithium ions, and that means better performance. 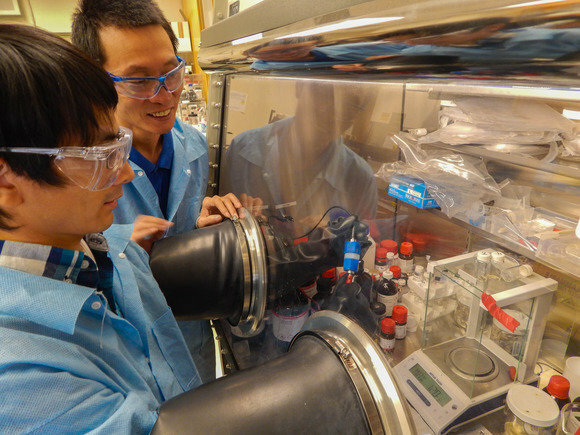 Using their new electrodes, charging rates are up to 40 percent faster, said Morris Wang, one of the engineers who worked on the research. It is detailed in the Nov. 5 issue of Nature Scientific Reports. There's lots to do before the work finds its way into commercial batteries, but Wang said initial research indicates less energy waste during charging and higher power output. He also said the team expects the new batteries will last longer, although is reluctant to put a figure on that until proper testing has been done. The improved battery life will be determined by a number of factors, but Wang said it could be from 10 percent to 40 percent better. Batteries are a major area of research for many institutes and companies because they have become one of the most important parts of our modern lives. Battery life is just as important in determining the performance of a portable gadget as the chips that go inside and battery technology has been advancing more slowly than other components. Lithium ion batteries are also being used in electric vehicles, where charging and range are important factors, so any advance that improves performance has the potential to be very important.